Kalter Schlag - thanoscardgamess jimdo page! This is a four-player game from Hamburg. It is related to Ramsch which in turn is a variation played in informal games of Skat. Literally "Kalter Schlag" means "cold hit", but it implies an element of surprise, so a more idiomatic translation would be "bolt from the blue". This name appropriately describes the way that a game can easily be lost suddenly and unexpectedly through an error of judgement or an unfortunate distribution of cards. Kalter Schlag is played by four people, each playing for themselves. 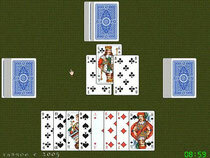 It is a trick-taking game in which the aim is to avoid winning tricks containing high-scoring cards. In each deal, the player who takes most card points in tricks loses those points, and the first player who loses a cumulative total of 2000 or more points over a number of deals is the overall loser.